Whitman County's aggregate income is over $785.1 million. * Many of the people in the rural portion of Whitman County must make decisions on where to shop and where to seek entertainment as some home towns provide only basic offerings. With the county seat in Colfax, many residents in northern portions of the county gravitate to the south. From Colfax, it is just 13 miles to Pullman, with Moscow just 8 miles beyond that. Lewiston is an easy 34 mile drive from Pullman. Residents of Colfax and south county look to both the twin cities of Pullman and Moscow as well as Lewiston and Clarkston. 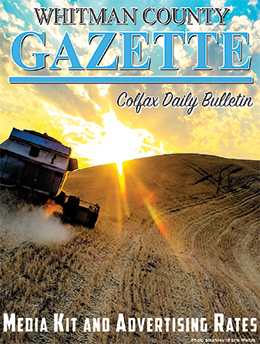 The Whitman County Gazette is the largest circulation paper in rural Whitman County. There is no better way to reach the important agriculture-based economy of Whitman County. This is a large and important local market that can be easily reached with the Whitman County Gazette. Advertise today by calling (509) 397-4333 or send us an email at [email protected]. We provide expert services, plus quotes and proofs at no extra cost. Check out our Media Kit for advertising rates and other unique advertising opportunities to see how the Whitman County Gazette can help your business grow! A column inch is one column wide by one inch in depth. Any combination of columns wide by inches deep is accepted (in half inch increments). Ads 17” or over are billed at 19.75”.